An anglophile('s) Scrapbook: My Everyday Makeup Routine. As I said in the previous post, I don’t expect to be an expert in makeup whatsoever. And when I decided to start this blog, it wasn’t my intention to do so many makeup-related posts. However, these days I don’t have much time to do anything extraordinary, as I’m spending every minute with my friends before I leave for London. So I decided to talk about my everyday makeup routine, which isn’t that particular. But I now tend to do always the same thing since I finally found something I’m very pleased with. After applying foundation (Catrice PhotoFinish 18h Liquid Foundation), and powder (Rimmel London Stay Matte) all over my face, I use the Catrice Eyebrow Set to define my eyebrows and I apply the lighter colour to all over my lid as well. I then use a Smudge Brush by Elf (that I purchased as part of Bamboo Set), to apply some eyeliner really close to my upper lash line and some under the eye. I then smudge it out with a blending brush. 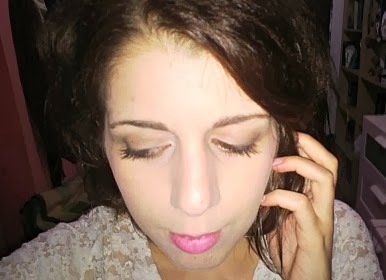 I then apply the Volume Express Mascara by Maybelline and some MUA Blusher in the Shade 1 on my cheeks. Sometimes I like to spice it up with some lipstick by Mac (in the colour “Saint Germain”), or the Just Bitten Kissable by Revlon (in the colour “Lovesick Passionnée”). It takes me almost ten minutes to do everything, since it’s nothing that difficult, and I think it’s the perfect amount of time to spend in doing your makeup on an everyday bases.